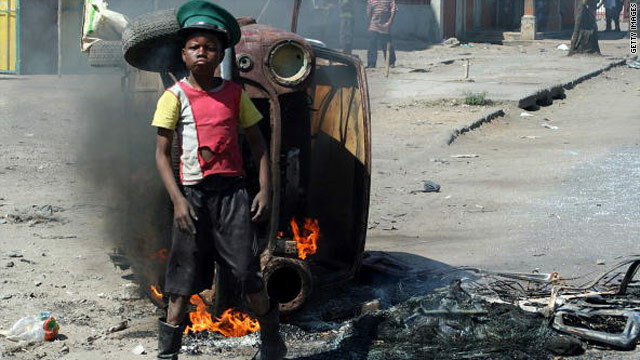 A protester on the streets of Maputo, Mozambique on September 2 following demonstrations over food and fuel prices. Hong Kong, China (CNN) -- While nations debate what to do about long-term problems such as climate change and dwindling water supplies, two words send immediate shivers down the spines of government officials across the world: Food security. A series of environmental disasters fueling a wave of food price volatility has given governments, "a much needed wakeup call," said Abdolreza Abbassian, an economist for the United Nation's Security of Intergovernmental Group on Grains. The UN's Food and Agricultural Organization will be holding a special meeting to discuss the issue and the recent volatility in Rome on September 24. The meeting was called after Russia decided to ban wheat exports after a punishing drought wiped out 25 percent of its crop. Moscow's decision pushed food prices up about 5 percent worldwide. Bread prices surged in some countries and triggered the deadly riots in Mozambique. Massive floods in Pakistan also caused huge losses to the country's crops, adding to the uncertainty in the markets. "The pace in which prices went up, nobody predicted markets could turn so fast," said Abbassian. "It's been two months and we're still struggling with it." Food security, in simple terms, is defined by the United Nations as food being available in sufficient quantities to reliably feed a nation's population. Market volatility is nothing new, especially when it comes to commodities. During the food crisis of 2007-2008, prices spiked dramatically: Rice surged more than 200 percent; wheat and corn jumped more than 100 percent. The cause continues to be debated, but the effects led to protests and deadly riots from Haiti to Mogadishu. But the current market conditions are very different from a few years ago, said Hafez Ghanem, the FAO's assistant director-general for economic and social development. "(I)n the years ahead we'll probably be seeing more of the turbulence we're experiencing now because markets are set to become more volatile in the medium term for at least three reasons: a) the growing importance as a cereal producer of the Black Sea region, where yields fluctuate greatly from one season to the next; b) the expected increase of extreme weather events linked to climate change; and c) the growing importance of non-commercial actors in commodities markets," Ghanem said in an interview posted on the UN Food and Agricultural Organization website. If the next few years could be more volatile, the next few decades could be downright frightening. The UN predicts that by the year 2050 the globe will be home to more than 9 billion people. In a recent presentation to The World Congress of Soil Science, Cribb said global demand for food is going to more than double over the next half century. In a worst-case scenario, Cribb describes a world where famine has broken out in several locations, leading to wars and hundreds of millions of refugees wandering the globe looking for food and shelter. That scenario is avoidable, he said, as long as governments make policy changes in their approach toward agriculture. Recent efforts by BHP Billiton to acquire Canadian fertilizer company Potash Corp. were viewed as the Australian miner's attempt to cash in on the growing importance of the agriculture industry. Chinese companies have also expressed interest in Potash as they try to secure fertilizer supplies for their own agriculture market. Famed investor and author of the "Gloom Boom and Doom" report, Marc Faber has appeared on CNN telling viewers the best long-term investment today is farmland and a focus on stocks that may benefit from food and water shortages. Cribb said unlike most other countries, China is aware of the potential risk to food security and has been taking steps to ensure it is prepared. That includes coming up with domestic policies to secure water supplies. But Beijing is also looking outside China by securing agricultural supplies in other regions, such as Africa. "We have to reinvent the way we grow food and reinvent our diet if we are to sustain the food supply through the peak in human numbers and demand," said Cribb. That is the challenge facing world leaders. So, at the upcoming meeting in Rome, Abbassian said he plans to ask every government delegate attending a simple question: "Are you preparing yourself for food security?"